PROCEEDINGS OF THE DIRECTOR OF SCHOOL EDUCATION & EX-OFFICIO STATE PROJECT DIRECTOR, SS, TELANGANA . HYDERABAD. Subject: Samagra Shiksha, Telangana, Hyderabad - Release of funds towards Annual Composite School Grant to Govt. & Local body and Model schools - Utilization of funds - Guidelines for the year 2018-2019- Communicated - Reg. 2.This Office Proc.Rc.No.21 91 /Grants/TSS/Plan MO 17, dt,22.0 1.2019. • Provision of stationary i.e., chalk pieces, white papers, registers etc., and conducting of exams. • Repairs to computers, projector, K-Yan, TV, ROT etc. + Cable, internet charges and other expenditure relating to digital classes. • Purchase of consumables in Labs. • Replacement and repairing of laboratory equipment. • Up keeping of basic amenities. • 10% of grant shall be utilized for Swatchata programme. • Purchasing of daily newspapers etc..
• The SMC shall make resolutions to utilize grants cm the above mentioned items and the resolutions shall. be maintained accordingly. • Social, audit shall be done by SMC on utilization of the grants. • Stock and Issue Registers shall be maintained for the items procured and utilized. • Expenditure and balance available shall be displayed on the notice board. • Discussion on utilization of grants shall be conducted at monthly SMC meetings. • Cash book and vouchers shall be maintained for all the transactions. • The DEO staff & DyE0 shall monitor the utilization of grants. Therefore, all the District Educational Officers in the state are requested to take necessary action to issue instructions to all the Head Masters of Govt. & Local body Schools and Principals of the Model Schools in the state for utilization of the grant. Subject: TSSA, Hyderabad - Planning & MIS - Release of Maintenance and School grants to all Government, Local Body schools as final instalment for 2016-2017 - Sanction accorded - Reg. The Finance Controller of this office is requested to make arrangements for release of an amount of Rs. 1798.88 lakhs (Rupees seventeen hundred and ninety eight lakhs and eighty eight thousand) towards Maintenance and School Grant to all the Government, Local body schools. The list of schools is emailed. 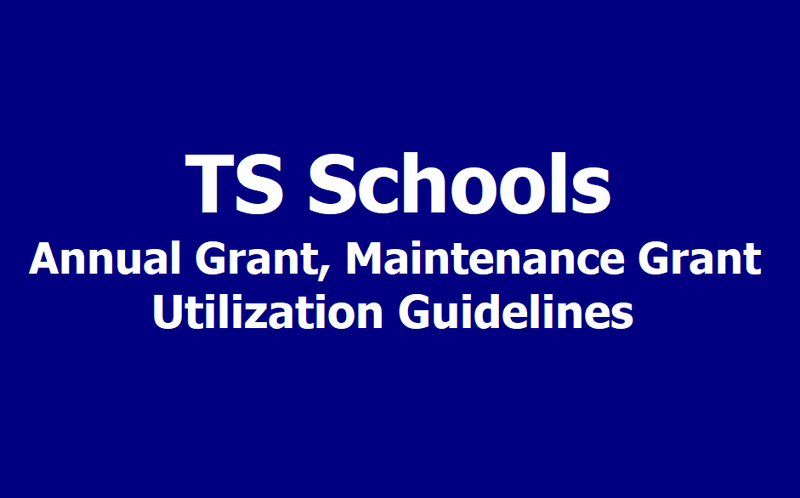 Norms for Utilization of School Grant and Maintenance Grants/Funds: School Annual Grant and Maintenance Grants will be released every year by the Telangana State Sarva Shiksha Abhiyan and in this subject guidelines have been issued for utilization of grants. This year School Grants and Maintenance grant will be released for this year. The following guidelines are issued for utilization of various grants that is school grant and maintenance grants will be released under Sarva Shiksha Abhiyan during 2016-2017. The schools functioning under Government, Local Body, MPP, ZPP, Tribal Welfare (ITDA), Social Welfare, APRIES, APSWRIES, APTWRIES, Disabled Welfare and Aided Management will be released school grants. The provision for primary school is Rs.5000/- per school per annum. Upper Primary Schools having I to VII or VIII Classes are to be considered as two schools i.e. Primary School (I to V) and Upper Primary School (VI to VII or VIII) for sanction of School Grant. Hence, an upper primary school is eligible for an amount of Rs.12000/- (Rs. 5000/- for PS + Rs. 7000/- for UPS) towards school grant. Therefore, an amount of Rs. 12000/- has to be released to Upper Primary Schools (I to VII or VIII Classes) towards School Grant. Purchase of games & sports material. Procurement of science lab material, games and sports material in case of upper primary and high schools. Purchase of soap liquid and towels for hand washing of children. Provision of stationary for conducting exams. The Schools having own buildings and functioning under Government, Localbody, Tribal Welfare, Social Welfare, APRIES, APSWRIES, APTWRIES and Disabled Welfare Managements are eligible for maintenance grant. Maintenance grant shall not be released to aided schools. The maintenance grant shall be released @ Rs. 5000/- to the schools having upto 3 classrooms. The maintenance grant shall be released @ Rs. 10000/- to the schools having more than 3 classrooms. Upper primary schools having I to VII classes are to be considered as two schools i.e., primary school (I to V) and upper primary school (VI to VII) for sanction of maintenance grant. However, it should not exceed the approved budget. Payment of electricity bills per month for primary for upper primary and upper primary sections of high schools. Maintenance of toilets: Not exceeding Rs. 300/- per month if the maintenance grant is Rs. 5000/- per school, if grant is Rs. 10000/- per school Rs. 500/ - either on outsourcing basis or by hiring a local person until an arrangement is made by Government. Maintenance of drinking water facility and providing potable water wherever permanent source of drinking water facility is not available. Minor repairs to floor, roof, compound wall, gate, furniture etc. and white washing. The SMC shall make resolutions to utilize all types of grants (except MRC) on the above mentioned items and the resolutions shall be minuted accordingly. Social audit shall be done by SMC on utilization of the grants. Stock and Issue Registers shall be maintained for the items procured and utilized. Expenditure and balance available shall be displayed on the notice board. Discussion on utilization of grants shall be conducted at monthly SMC meetings. Cash book and vouchers shall be maintained for all the transactions. Headmasters are responsible for utilization of grants as per guidelines at school level; School Complex Headmaster & Asst. Secretary at Complex level and MEO at MRC level.